This is the second weekend (10/15-16/2016) of Service Disruption from Los Angeles to San Diego. No weekend service as tracks will be closed to allow for construction crews to perform work on multiple improvement projects. 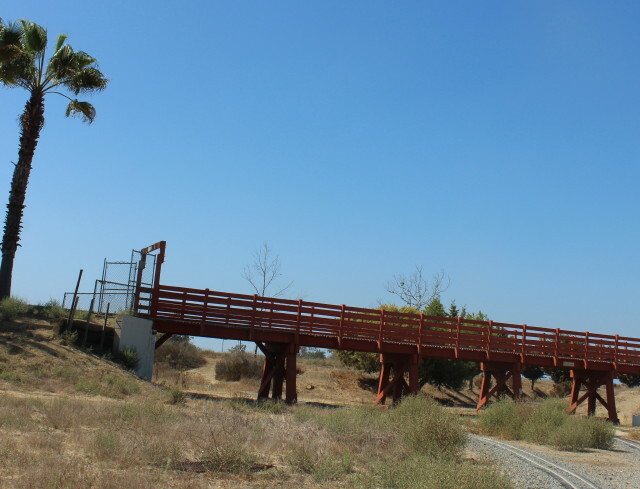 This includes the demolition of the Sixth Street Bridge in Los Angeles, construction a second rail track in San Diego County, improving railroad bridges over the San Diego River and Los Penasquitos Lagoon. Metrolink service in Orange County will also be limited. Today started with me driving to Chris Guenzler's home in Santa Ana. From there we took Chris' car and headed for the 91 freeway bound for Corona. Construction work had been going on this freeway on weekends for the last several months. But this weekend we were lucky as there was no closure; it would resume the following weekend. After traveling about 45 minutes on the 91 and I-15, we arrive in Corona, CA and took the Temescal Canyon Road exit to arrive at our first stop. As we arrived a few minutes before ten, the farm was still rubbing their eyes and waking up to start another day. Busy workers were hustling around their shops and work areas setting up for the new day. This gave us some time to look around and explore the farm. This guy wants to get the day started and let the fun begin. There was an assemblage of service dogs and their trainers out for a training assignment. Covered bridge / train barn still closed. Not yet ready to start the day. With the doors open, a look inside. When the box office opened, we bought our train ride ticket. Along with us were the service dogs and their two legged minders. Just as the train was leaving the station Chris yells that his camera is not working. Seems the shutter button was malfunctioning. So nothing would make it operate and he ended up with no pictures. After the ride, he was able to get it operating. So we bought another ticket to ride. The following set of pictures is a blend of those two rides. Exiting the covered bridge we are met with wildlife in the wilderness. We will be leaving the wilderness and animals as we approach the covered bridge. After finishing our rides, we pass a little fish pond for several photos. And what would a farm be without a tractor. Also at Tom's Farm this weekend was to be a Civil War Reenacting at 11:30 AM and 2:30 PM. Unfortunately we didn't have the time to stay and watch the battles but check in out next year if interested. Also if you are interested in seeing a Civil War Reenacting come to Huntington Beach on Labor Day weekend for battles in the Central Park behind the Central Library. Click for Tom's Farm. Click back button on your browser to return to this page. After leaving Tom's Farms on Temescal Canyon Rd, we returned to I-15 with a north bound heading. At the 91 freeway we went west toward Los Angeles. At the 55 freeway we went south the complete length to the end in Costa Mesa. Once in Costa Mesa, we made several detours and u turns. But we found our way to our next attraction with little time lost. From an article in Daily Pilot 10/16/2016: "Costa Mesa residents got in on some fall-themed fun Saturday during the first day of the annual Scarecrow and Pumpkin Festival at Fairview Park. Presented by Orange County Model Engineers and supported by groups including the city of Costa Mesa and the Costa Mesa Historical Society, the event offered pumpkin picking, face painting, train rides and other activities at Goat Hill Junction in the park. 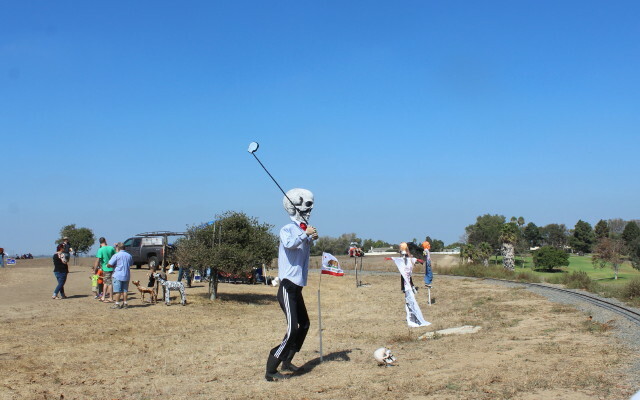 The festival also featured a scarecrow contest in which residents stuffed their cleverest creations to put on display. The festival was originally held in Costa Mesa from 1938 to 1941 and was revived in 2013 in honor of the city's 60th anniversary. The event continues from 10 a.m. to 3 p.m. Sunday. It is free to attend, though some activities have a fee." Our current venue is a desolate plot of land located on a hill top with a stunning view of parts of Orange County. It could easily be used as a set location for a wild west movie. After finding a parking space we went and queued up to take our free train ride. There was a good turn out today for the pumpkin picking, face painting, train rides and other activities at Goat Hill Junction and our wait was about thirty minutes to board our train. While waiting we were able to see all the different train sets running today. MOW removing pebbles and debris from track. The trains that run on the track at Fairview Park are 1/8th the size of the real thing, and operate like real world locomotives. Most types of locomotives run on these tracks. "Live steam" refers to working scale models of full steam locomotives. These "live steamers" burn coal, oil or propane to produce steam in the boiler for use in driving the locomotive. Diesels are powered by internal combustion engines and are replicas of the types of locomotives you would see pulling trains today. Electric locomotives, just like their full-size prototypes, run very quietly, using power stored from internal batteries. Most of these engines and rolling stock are built and owned by the Orange County Model Engineers members and some locomotives can pull more than 20 adults at one time. 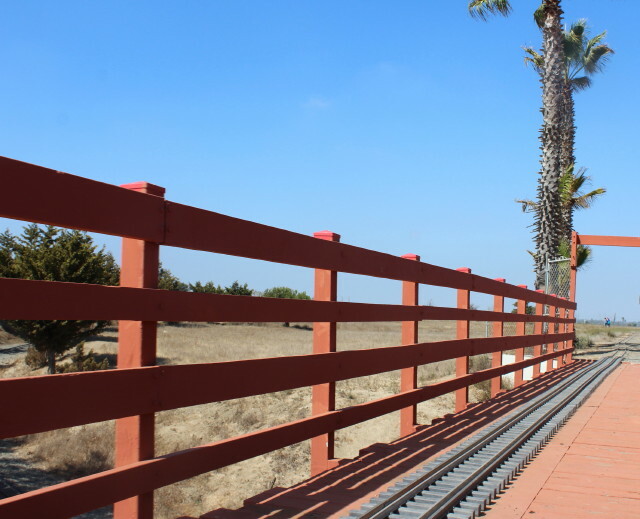 The City of Costa Mesa granted the Orange County Models Engineers a 25-year use agreement, allowing the construction and operation of a miniature railroad, train station and gift shop at Fairview Park. The 40 acres of open park contain 20,000 feet of track in a natural setting. In scale miles, that is more than 30 miles of track, sidings, and bridges, making Mackerel Flats and Goat Hill Junction Railroad one of the largest miniature tracks in the world. Fire truck rides were offered. Swinging for show at the pumpkin picking patch. The greens the golfer was aiming for. Raven Nevermore, a witch scarecrow greets train riders. Brakeman racing the train to beat it to the switch. He was able to beat the train to the switch and throw it in time. 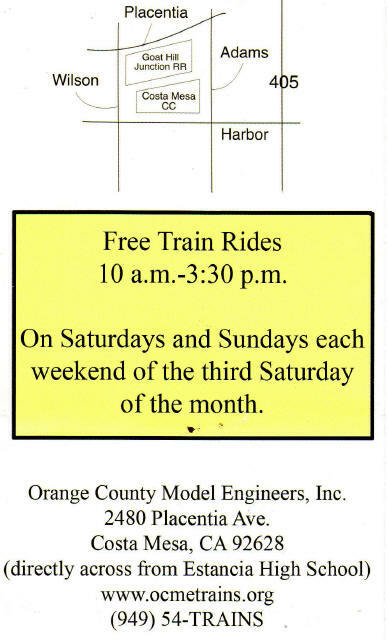 The Orange County Model Engineers Inc. is a non-profit organization that is dedicated to promoting and educating the public about live steam hobby trains and train history. Membership is open to anyone with an interest in trains, large or small. Guest are invited to their weekly Saturday work parties at the track site, monthly general meetings and especially on public riding days on Saturday and Sunday each weekend of the third Saturday of the month. Finishing our adventures at Mackerel Flats and Goat Hill Junction Railroad in Costa Mesa, we then headed home. Another good day of exploring Little Gems in Our Neighborhood.